KIEV, Ukraine -- Clashes over the weekend in south-western Ukraine between members of a far-right volunteer militia and local authorities have raised fears that violence is spreading beyond the conflict in Ukraine's east and could further destabilise the country's fragile political balance. The latest clashes have occurred in a region which borders EU members Hungary and Slovakia. They also underline the delicate and highly risky relationship between the Ukrainian government and the volunteer militias, who are helping fight Moscow-supported militants in eastern Ukraine. On Saturday, in the city of Mukachevo, around 20 members of the ultra-nationalist Right Sector volunteer battalion exchanged gunfire with police and the security detail of a local politician. At least three people were killed, reports said, two of whom were from Right Sector, and 13 were wounded. Currently, officials in the capital, Kiev, have sent reinforcements as well as armoured vehicles to the area, which is next to Ukraine's borders with European Union members Hungary, Slovakia and Romania. Two Right Sector members have given themselves up, officials say, while authorities are searching for the remaining gunmen. Right Sector for its part has set up a roadblock outside of Kiev, and are demanding the resignation of Interior Minister Arsen Avakov and other officials. Despite the stand-off, Kiev at the moment very much needs the volunteer battalions. They are often more motivated than the regular Ukrainian army and have engaged in some of the worst of the fighting. 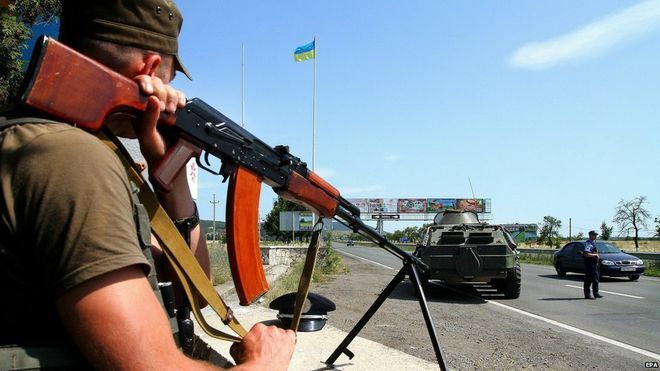 Most of the battalions have now placed themselves under Kiev's direct control. But a few, like Right Sector, are still wholly or to a large degree independent. And as the events in Mukachevo indicate, some of these groups follow their own agenda. Details are extremely murky over what happened in Mukachevo. Right Sector members say they were cracking down on the illicit export of contraband cigarettes into the European Union, which generates millions of dollars and contributes to local corruption. Others say that Right Sector is itself involved in the illegal cigarette trade, and has become entwined with criminal interests. Still others say the group has been infiltrated by Russian special services and is engaged in carrying out provocations to destabilise the country. None of the proponents of these scenarios have provided any conclusive evidence, however. What seems clear is that Right Sector possesses an impressive collection of firepower - which they were capable of employing in a corner of Ukraine furthest from the fighting in the east. Videos and reports from the fighting suggested they had a large number of automatic rifles, grenade launchers and a hand-fed machine gun. Another key question is how much support they enjoy. After Mukachevo, some volunteer battalions have come out in support of Right Sector. The group is also a political party - albeit on the extreme fringe, after receiving less than two percent of the popular vote in parliamentary elections last year. Still, even if they do not vote for them, many Ukrainians view them positively, as patriots who are defending the country from Russian aggression. President Petro Poroshenko promised this week to move against "illegally armed groups". At times, Right Sector seems as if it came straight out of the Kremlin's playbook to portray Ukraine as awash with ultra-nationalist extremists. Other times, when they attack LGBT rallies or sport white-power symbols, they seem very sincere indeed in their far-right convictions. Whatever the group's motives, for many, their weaponry and willingness to use them are sufficient cause for concern.